Rigid flex printed circuit boards are hybrid boards that employ a combination of both flexible and rigid board materials. Rigid-flex PCBs provide a simple means to integrate multiple PCB assemblies and other components including display, input or storage devices with thin, light composites that integrate wiring in thin, flexible ribbons between sections. 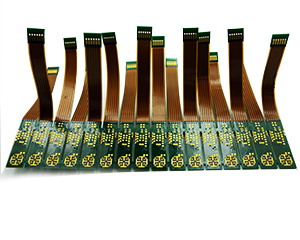 Rigid flexible PCBs can be utilized in various array of applications. Increasingly, rigid flex board fabrication has been used for their space and weight reduction capabilities. Viasion Technology provides our customers with rigid flex combination boards with a great variety of technologies, from complex multilayer rigid flex for commercial applications to high reliability PCBs.